With the weather in the Everglades still holding warm and sunny we decided to fish for snook and redfish using plugs and jigs. With a rising tide we decided to work the boat along a beach front full of blown down trees and snags and within minutes scored with a nice 35 inch snook. 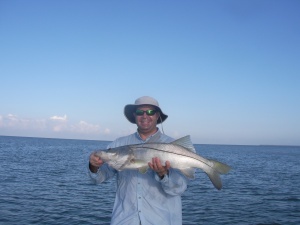 As ther morning went on the snook continued to bite along with some nice redfish. This time of year in the everglades with the weather getting warmer and warmer is a great time to fish.